I call Gary Smith at Sarasota Yacht & Ship to find out what's happening to the 51.82 expedition superyacht Echo des Mers, now that he's sold her. And, Gary tells me that she's now heading for the Dominican Republic for a refit before being based for charter in the Seychelles. As a charter vessel she offers accommodation for 44 guests along with 18 crew and and has a worldwide range, with a cruising speed of 11 knots. 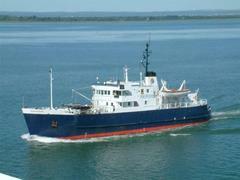 Built by Collingwood in 1966, she had a major refit in 1997 and was on the market at $1.75 million.